An immortalized cavalry commander joins forces with the high-priest of the god of war.... Where myth meets legend, two men kiss and Tempus' world changes forever. Meet and mourn the Slaughter Priest in "A Man and His God." In this canonical short novel, the Sacred Band begins when Abarsis, Slaughter Priest, brings his Sacred Band to Tempus and dies in his arms. “Go with more than that, Stepson,” whispered Tempus, who leaned forward and kissed him gently on the mouth; and Abarsis breathed out his soul while their lips yet touched." This landmark short novel contains what may be the first male/male kiss in modern fantasy, and was widely reprinted, after appearing in somewhat different form in Thieves' World(r), in the Science Fiction Book Club, two Issac Asimov collections, and the Baen Book "Tempus" by Janet Morris. Would you consider the audio edition of A Man and His God to be better than the print version? The narrator, David Kudler, breathes life into the story. It all starts with the words. The writing by Janet Morris is exquisite, which gives him rich material to showcase his incredible talent. The voices in him are exceptionally varied in pitch and volume. David Kudler has a warm, versatile voice, and a great ear for character and dialect. The overall story is carried in the voice of the story teller, bringing to the fore every nuance in the writing. For me--being a fast reader who may skip some of the more subtle undertones while reading a print book--his narration truly makes me listen and take in the lyrical beauty in text. In addition to the story teller, he fleshes out many characters--Tempus, Abrasis, and others from the Sacred Squadron. He even gives 'The God in Tempus' head' an eerily resonant, other-worldly voice, which made me feel great owe. Tempus is the center of the story. Abarsis, the Slaughter Priest from the North, brings his Sacred Band to Tempus, a warrior who is grappling with his curse and his blessing: he cannot die, nor can he enjoy his immortality. At the beginning of the story this lone mercenary is perceived by others as 'Death Himself'. By the end of the story, the wounded Abrasis takes his last breath in Tempus' arms. The scene features one of the most delicate descriptions of helping a dying man find a measure of comfort amidst the pain. As he breathes out his soul, Tempus seals his last moment with a symbolic signature of a kiss. What does David Kudler bring to the story that you wouldn’t experience if you just read the book? Take a listen to Kudler's voice, and you too would feel like cuddling in bed with the book, or perhaps with the character he plays. Well researched, well written, and well done! Janet Morris clearly knows ancient history and mythology plus she's a phenomenal storyteller. Rich detail aids this novella in making an emotional impact on the reader. I would recommend this story as well as the rest of her books to anyone who loves historical fantasy books, and the audio version is wonderful. If you could sum up A Man and His God in three words, what would they be? It's hard to say if I like Tempus or Abarsis best, but Abarsis sacrifices all in this story of heroism that brought me to tears and made be believe there really was a Storm God at work in antiquity. What about David Kudler’s performance did you like? Kudler's voice is multifaceted, bringing different characters to life but always faithful to the written words. He whispers in my ear and takes me places I haven't been before. These characters are beloved by many, first met in the million-copy bestselling Thieves' World series, so the narrator must be up to the task of bringing them to life. Yes, and I did. Listening takes about an hour and a half and I was sorry when the tale was told. I've listened to it several times since then and loved it every time. If you're a lover of the Sacred Band of Stepsons, this story is one you'll treasure. If you've never read the Sacred Band tales of heroic fantasy, this is a great place to start. Dark, gritty, violent and passionate, these mercenaries of the god of war are complex and realistic heroes in the ancient world where magic and the gods go to war. You'll love them and hate them, but they'll always move you. A short novella focusing on Tempus (sometimes referred to as “Death”) and Abrasis (Slaughter from the North) both are mercenaries of the god of war; they are faced with decisions that make them tragic, heroic and complex. The most moving scene of the book comes when Tempus comforts Abrasis as he dies in his arms; Tempus seals Abrasis’ death with a tender kiss. The scene of Tempus comforting Abrasis as he breathes his last breath before he succumbs to death and then sealing his death with a kiss is so vivid and moving that I was reduced to blinking the tears from my eyes. Janet Morris has researched her subject very well and brings this ancient world of mythology to life through her words and vivid descriptions. I enjoy stories with a mythological base to them but I found this one to more moving emotionally than any other I have heard or read. Morris wrote this book in such a manner that anyone could pick it up and immediately become engrossed in it. However, this is not a book you can only pay half attention to and get it. This is one that requires steady listening to in order to pick up all the nuances and plots. David Kudler approached his narration of this book professionally, making the passion of the characters come alive. His voice for Tempus was hypnotic. A very short listen but one packed with action, violence and moments that will move you. 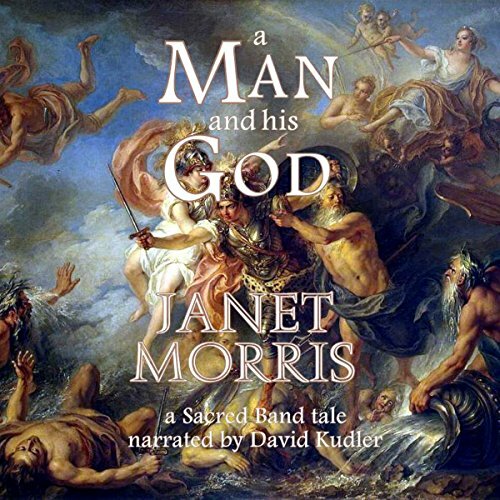 A magnificent story in the Sacred Band tales of the highest quality that only Morris can produce. As with all the other works, this combines ancient history, mythology, war and deep friendships. Really looking forward to the next installment in this series.